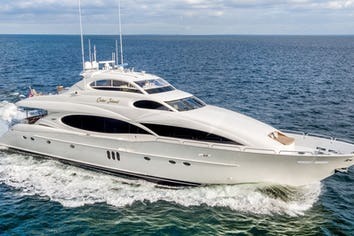 Living life to the fullest aboard this magnificent 116' Azimut Grande - custom built for luxury and comfort throughout! The Azimuts lines are very aesthetic, elegant, athletic and modern. The rounded shapes and elliptical windows give this yacht a sleek high profile look. Main Deck Salon and Dining: Satin-finished cherry wood throughout the main deck, salon and galley combined with illuminated Onyx accented panels that glow with warmth and enhance the inviting dining area and salon, welcoming and soothing guests aboard. The main companionway boast rich and bold marbles interspersed with a unique pattern repeated in the custom glass dining table - seating for 10. Accommodations: Fit for a King with the Master King stateroom forward on the main deck which features three over sized elliptical windows for expansive views to port and starboard, with ensuite deep Jacuzzi tub, separate shower and spacious entry area. Below are four guest staterooms - the two aft are doubles while the two forward feature twin berths, all comparable with ensuite facilities. The guest’s companionway features refrigerated drawers for stocking late night snacks, beverages and amenities for guests. Entertainment: The array of electronics onboard expands onto the aft deck with foldaway anti-glare TV in the aft cockpit where dining el fresco is also popular for up to 10 guests. Entertainment options continue on the upper deck with a customized spa Jacuzzi and a crafted cover that rises and converts to chaise lounges for additional sunbathing. The top deck also has a wet bar, wrap around settee with a polished teak table for additional dining for 12 under the 2 retractable sun roofs. On the wide bow there are even more spacious and comfortable, extra large sun pads and seating. One of the best features yet, is the "beach" where the garage door expands out over the swim platform for landing and playing in the water. This makes boarding the 17' Castoldi Jet tender (built and chosen for passenger comfort) easy and accessible for guests. With a cruising speed of 25 knots this yacht won't have any problem taking the guests where they wish to go on a moment's notice. Customized for comfort and fit for a King with the Master "King" stateroom forward on the main deck and features three oversized elliptical windows for expansive views to port and starboard, with ensuite deep Jacuzzi tub, separate shower and spacious entry area. The guest’s companionway features refrigerated drawers for stocking late night snacks, beverages and amenities for guest. VIVERE is fully air conditioned through out. Crew has separate heads and showers. Mike has been a licensed captain for 13 years, leading large crews and operating privately owned yachts, as well as, USCG Certified Passenger Vessels. He has now been the Captain of VIVERE in Florida to New England since January 2010. As captain, he has managed the maintenance and operation of this customized yacht, assuring that she is ready to run and please the owners and many guests aboard, while always keeping charter in mind for the near future. He is enthusiastic about charter of VIVERE and is experienced with all types of guests; corporate groups and VIP'S, celebrities and families from around the world. He was previously Captain aboard 75' motor yacht AVANTI which had many successful charters throughout his term aboard in Florida, New England and the Great Lakes. 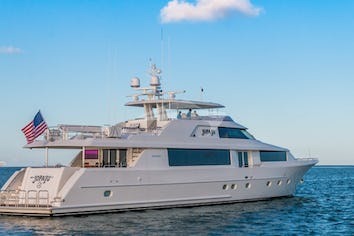 His prior experience is Captain aboard M/Y Millennium - New York, S. Florida & the Bahamas among other reputable charter yachts ranging from 45' - 150'. Robert was born and raised on the Great Lakes so he learned to drive boats at the very early age of 7. This progressed into bigger boats as he got older, bringing along additional skills and experience in the industry. At 20 Robert moved to Ft. Lauderdale pursuing work on boats in a tropical climate year round. He joined VIVERE in August of 2015 maintaining the yacht and tender sound, both cosmetically and mechanically. He has logged over 2,000 nautical miles along the Eastern Seaboard, including the waters of the Bahamas. Robert enjoys meeting new people and looks forward to making charter guests welcome and comfortable onboard. A native of Oregon, Kate is a true Northwest-grown Sea Gypsy. She has spent several years on a wide variety of luxury yachts and catamarans, sailing the Caribbean and the Northeastern shore; Alaska, and Canada. Kate brings to each Charter her enthusiastic, cheerful, and ready smile. You will find her to be high energy, fun, always joyful and able to assist you to ensure an individualized experience. She has a focus on professionalism, warmth, and concern for guest satisfaction.Kate is also a licensed Aesthetician who can refresh your sun-kissed skin or relax you with a facial at the end of a long day of beach activities or shopping. On her time off you will find her bag always packed for another one of her world adventures. A New York native, Eric has been a deckhand on VIVERE for approximately 9 months. He has traveled South America working as deckhand on M/V Yorktown 257’ for over a year. He is passionate and wants to learn as much as he can about the industry hoping one day to become a captain of his own sail boat. Hors d’oeuvres: Sun dried Tomato, Pesto, Cheese Torte. Mini Chicken Wellingtons. Hors d’oeuvres: Spinach crepe spirals, with pine-nuts & sun dried tomatoes. Lamb Meatballs, with Mint/yoghurt dip. Dessert: Fresh Strawberry & Chocolate Tart, Grand Marnier Whipped Cream. Dessert: Chocolate pate with raspberry sauce & whipped cream. The trip was amazing. The crew was fantastic and made you feel right at home. This was our first experience with this type of trip and the condition of the yacht and the crew made you feel like a million bucks. This is something we would be doing again in the future and would charter Vivere again.